Very Positive (34) - 91% of the 34 user reviews in the last 30 days are positive. Very Positive (830) - 84% of the 830 user reviews for this game are positive. 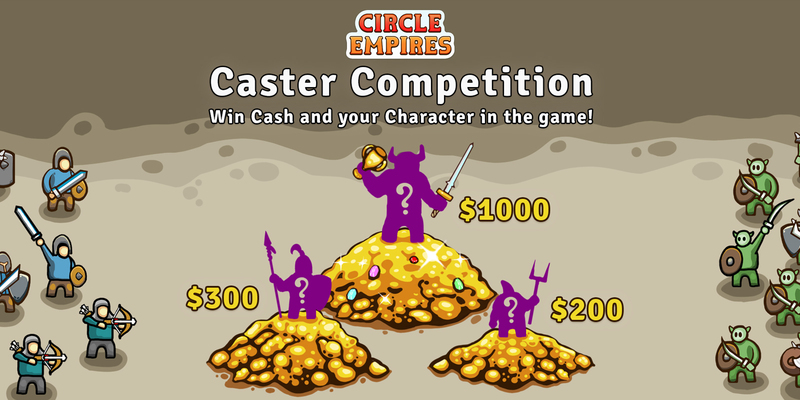 Sign-up for the Circle Empires caster competition! Feeling fast and curious? Then the Circle Empires Apex Monsters! Caster Competition might be relevant to you! Win $1000 in cash for speedrunning our strategy game and get your channel immortalized by getting a character in-game, based on your channel name. Other prizes include more money, in-game stuff and featuring the videos on the Circle Empires Steam page to thousands of viewers. Record the gameplay - videos with witty commentary can also win the Style Award! Post a video with your fastest victory to your own YouTube channel (up to 10 videos can be included to increase one’s chances). Now, to the most rewarding part of this whole thing: the prizes. For completing the game in the shortest time within the given settings. Prize: $1000 and a new, in-game boss character (forever present in the game's base version), inspired by the participant or their YouTube channel name, with developers having the final say (For example, a hypothetical caster called "Wolfyyy999" might get a wolf with their name on, within the game). Chosen between 10 next fastest victories in given settings. Prize: $500 and a new, in-game character (forever present in the game's base version). Decided by jury - their favorite video with commentary (of course, only videos with commentary qualify for this one). Select videos will be showcased on Circle Empires’ Steam page. Prize: $300 and a new, in-game hostile building (forever present in the game's base version). 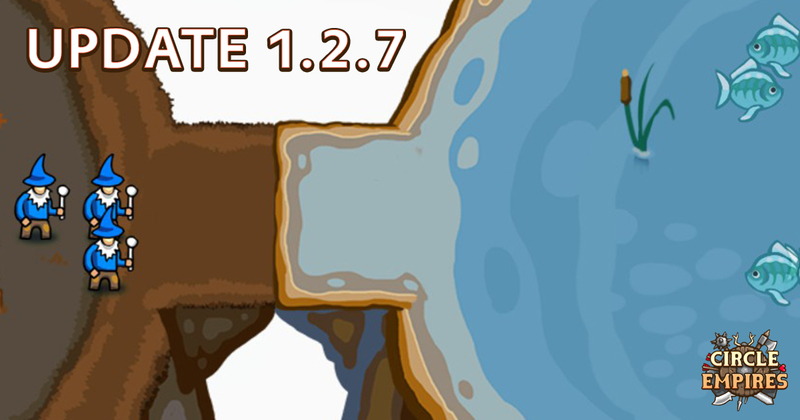 Update 1.2.7 - Easier starting circles, balancing & fixes! We kick off 2019 with more balance adjustments & fixes based on community feedback and videos. A special thanks to everyone who has shared their experience of Circle Empires with us! This is what really keeps us going. Happy new year to all! Adjusted the way circles grow in difficulty. The circles right next to your starting circle area are easier to capture, especially on high difficulties. Circles that are further away have guardians that are a bit stronger. Unlocked +1 difficulty level from the start for all game modes as some players were suggesting that they played on the hardest available difficulty and it was a walk in the park. Knight price changed from 100 food & 150 gold to 180 food & 40 gold. Hp increased from 480 to 500. Level 3 farm: available food amount increased from 600 to 800. Sunken Ruins (frog spawner) strength rating increased from 200 to 350. Level 1 farms available food amount increased from 180 to 220. Previously, some players felt like they were "losing resources" because the cost is 200 wood and you got 180 food out of it. This caused a puzzling situation where people were struggling with a lack of food but were reluctant to make farms. This puzzle is now more simple, you get more out of it in addition to converting wood to food. Made the starting circle available food amount less random. You now always have 2 blueberry bushes for a total of 600 food, previously it was possible to have 0-2. Buildings that have an attack and spawn creatures (e.g. barracks) no longer gain experience from combat. They get experience from spawning waves of creatures which is a more predictable behaviour. Before that, it was possible that e.g barracks accidentally finished off your dragon and gained a level, which could turn the battle around very unexpectedly. Hammerman and Giant Maul Warrior (Apex Monsters DLC only) have more clear bonus damage vs armor. E.g. +50% damage vs armored targets. This also means that heavily armored units take less extra damage than before. Updated the Unity engine to latest version which fixes various issues (including Linux input glitch). Fixed an issue that caused enemies to attack you immediately after loading a save game. Due to that, old save games are no longer functional unfortunately. Fixed an issue with a legacy update system popping up. Fixed an issue where the attack cursor was the default cursor. Now it's a sword again. Added an option to delete save games.